A pair of surfers could be seen criss-crossing with whales near the Golden Gate Bridge on Thursday as the giant mammals frolicked and breached in the water. A few times, the windsurfer and kite-surfer got a little too close to the swimming whales, following them and cutting into their path. National Oceanic and Atmospheric Administration guidelines prohibit whale watchers from getting too close to whales and other marine mammals. 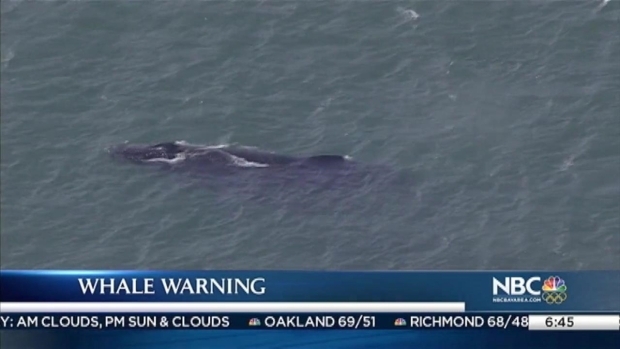 Migrating humpback whales have been swimming into San Francisco Bay in unprecedented numbers over the past two weeks — an onslaught that experts say could be caused by an unusual concentration of anchovies near shore. 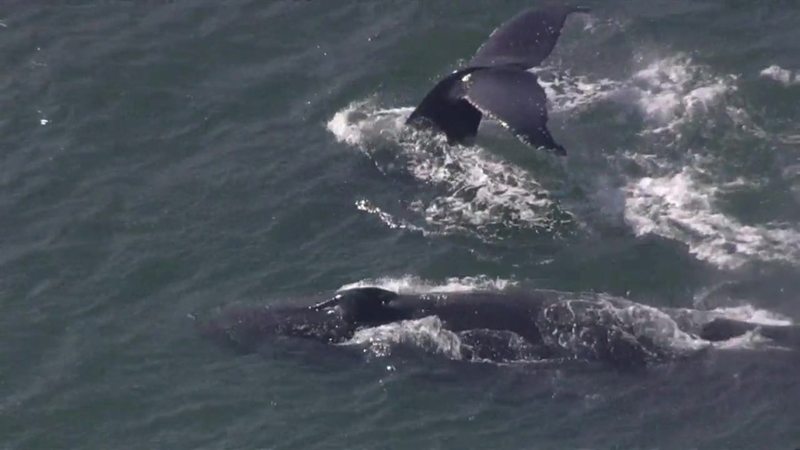 Just Monday, whales were spotted swimming near Crissy Field. A pair of surfers could be seen criss-crossing with whales near the Golden Gate Bridge Thursday, as the giant mammals frolicked and breached in the water. Stephanie Chuang reports. As many as four humpbacks at a time have been spotted flapping their tails and breaching in bay waters, apparently feeding on the anchovies and other schooling fish during incoming tides, the San Francisco Chronicle reported Thursday. NOAA guidelines require people to restrict their activities within 100 yards of marine mammals. They also prohibit people from following behind a whale or approching directly in front of a whale. Whale watchers should avoid excessive speed. Marine mammals are protected under the Marine Mammal Protection Act and large whales, such as sperm and humpback whales, are also protected under the Endangered Species Act. Violators can be fined up to $10,000 for each violation, or criminal prosecution with a fine of up to $100,000 or imprisonment for up to one year or both. It's normal for gray whales to wander into the bay, but humpbacks generally feed farther offshore and are not accustomed to navigating shallow water and narrow straits such as those in San Francisco Bay, the Chronicle reported. 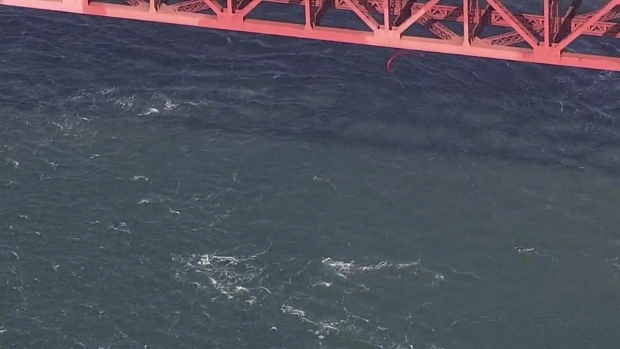 A windsurfer and a kite-surfer were spotted criss-crossing with a pair of whales near the Golden Gate Bridge Tuesday. "The deeper they get into the bay, the more acoustically confusing it becomes," she said of the whale's sense of direction. Schramm's biggest fear is that the giant visitors will go the way of Humphrey, a famous 40-ton humpback who caused pandemonium in 1985 when he swam through the Carquinez Strait, up the Sacramento River and into a creek.